If the face is considered very important, every organ is important and its beauty escalates self-esteem in everyone. If we then look at the NOSE area, some will have featured look, some will have misaligned nose due to injuries after some accidents. These cases are corrected by a procedure called Rhinoplasty, which is done for both cosmetic and plastic surgery purposes. Generally, the reconstructive procedure is done to restore the original nose appearance as well as ensuring the proper function of the nose with no disturbances. The patients resume their confidence once the surgery is successfully done. Rhinoplasty is done by a maxillofacial surgeon, who is an expert in the surgical procedures of the neck, face, and jaw. Open and closed Rhinoplasty is of two types. Surgical time is shorter with success in the closed type of Rhinoplasty. The patient could recover fast due to the internal incision. No scars are left out externally. Open Rhinoplasty requires an additional incision on the undersurface of tissue, that separates the nostrils called the columella. This procedure makes a small scar on the external nose. It is said to be the best procedure for complex nasal deformities. Generally, surgeons will take photographs before and after the nose surgery for any litigation in future. Two types of Rhinoplasty say primary and secondary are available based on the needs of the patient. 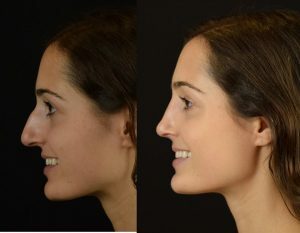 Correcting the function and restoring aesthetic features of the nose is the procedure of primary Rhinoplasty. When primary Rhinoplasty is unsuccessful, the secondary Rhinoplasty is performed which is also called revised Rhinoplasty. The secondary Rhinoplasty is more intricate than the primary. Keen attention is taken on the mucous membrane, external skin, and cartilaginous support to ensure that the patients should not have any further complaints regarding aesthetics even after completing secondary Rhinoplasty. Handling the nasal subunits is important to restore the function of the nose after the patients surgery. An appreciating correction, would be obtained if the procedure is done with proper care. Dr. Philip Mathew MDS (Oral & Maxillofacial Surgery) is the Chief Physician in JP Dentofacial & Implantology in Thrissur, Kerala. A well-equipped infrastructure and personal attention towards every patient escalated our treatment level. As a result of whe cost of ich even abroad patients are visiting us for their treatments. We are one of the Best Centers for Rhinoplasty in Kerala. The Cosmetic Surgery of Nose in Kerala is much lesser here than the other centers.